**** The three chamber works on this 2007 release from Lapis Island Records may give the impression that Peter Scott Lewis is an eclectic composer of a highly poetic nature, yet they also point to the importance of organization in his music and demonstrate a formal consistency that may not at first be apparent. A sublime, even dreamy mood is established at the beginning with "A Whistler's Dream" (2005), a four-movement work that could be viewed as a programmatic sonata for flute and piano, or conversely, as a somewhat formalized suite of four evocative tone poems; either way, its success is due to the strength of its long-breathed melodies; its rich, thirds-based harmonies; the evenness of its moods; and its balanced form. Lewis' musical language is often freely chromatic and quite rhapsodic in spirit, so it might seem on the surface that these pieces are loosely organized and nearly improvisational in origin; yet structure is always clear in Lewis' work, and the modified classical forms that he employs keep his expressions well within the expectations of chamber music. This is evident in the tightly organized "Serenade for Winds" (2005), which is quite tuneful and varied in effects, yet efficient in the development of ideas and compact in its partita-like arrangement. 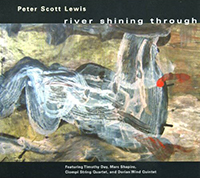 "River Shining Through" (2004) is indebted to the modern string quartet and is the most harmonically complex and energetic piece on the program; yet Lewis avoids the density and hyper-virtuosity that make many contemporary string quartets difficult to appreciate, and the lightness of its rhythms and clarity of its textures bring out the underlying dance impulses. The performances by flutist Timothy Day, pianist Marc Shapiro, the Dorian Wind Quintet, and the Ciompi String Quartet are all first rate in execution and interpretation, and they are handsomely served by the studio's responsive acoustics and exceptional engineering. River Shining Through is well-crafted and engaging. Exploring ideal textures for string quartet, Lewis shows a knack for the medium. He gives the players some fun counterpoint through out, and spicy rhythmic ideas in the final two movements. Lewis shows equal skill and intuition when writing for winds. Serenade for Winds is delightful and bouncy; with tender moments juxtaposed with driving chordal textures ("Serendipity"). Lewis' works are full of contrast, alternating between complex harmonic motions and simple melodies.